At one recent meeting, our group sits entranced by our presenter sitting behind his electronic wizardry being serenaded by the likes of Dizzy Gillespie, Billie Holiday, Art Pepper, Count Basie, Miles Davis, Earl Hines, Django Reinhart, Sonny Rollins, Oscar Peterson, Benny Goodman, Jessica Williams, Stan Getz and many, many more. We play jazz on vinyl, CD and digital formats and listen to trad, swing, big band, bebop, Latin and much, much more, mostly from the first 60 years of the 20th century. We take it in turns to lead a session with whatever turns us on – it is a jazz group after all! This is voluntary, if you just want to sit and listen that is fine. We listen, discuss and above all, enjoy! 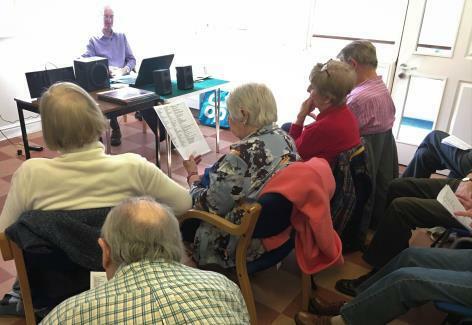 Our sessions are varied and members present their favourites as part of the group’s programme for the year. This could be artists, styles, arrangements or indeed videos of live performances. New members welcome. If you fancy a varied jazz interlude on a wet Thursday morning then where better place to be than at one of our sessions! Knowledge of jazz is unimportant, just let it wash over you and enjoy!